You may have seen our recent post on the Home Chef Coupon Code that you can save $30 Off your first order and now we're here to give our review on this awesome home delivery service! You most likely have seen Home Chef or another one like it on the TV lately and wondered how it measured up or was it worth it. Use the promo code "FAMILY" to try out Home Chef for $30 off! Are you busy during the day? Do you come home at the end of the day and wonder what to make for dinner? Do you like quick to make meals? Do you hate grocery shopping? If you answered Yes to ANY of those questions then I recommend you try out Home Chef! So what can you expect? 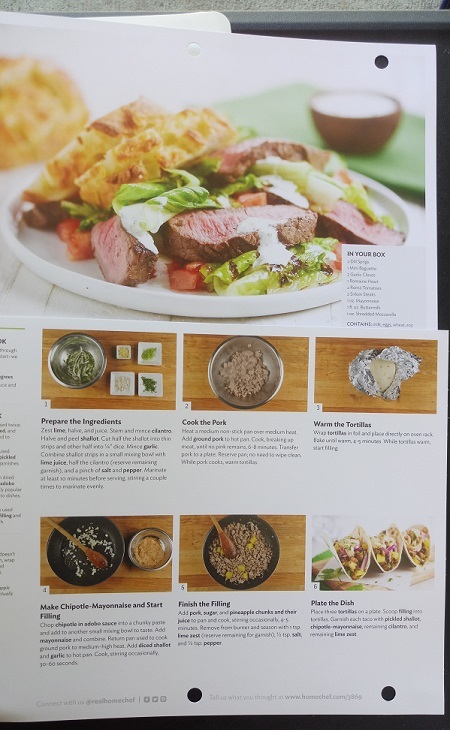 Well when you first sign up with Home Chef you let them know any foods you are trying to avoid as well as any dietary restrictions (dairy free, etc) then you can enter coupon code FAMILY to save yourself $30! You don't get to pick which exact meals you get and you find out which ones after your order has been placed. I was totally surprised to see more in the box than just the food and ingredients but it came with a little Home Chef Notebook and recipe cards! The notebook is one that can easily be stored in a drawer or with other cook books and it's durable enough to last. I will say because of the time it takes to ship the items and received them I was a bit worried about the meat for the meals still being edible but it was still very much cold when the box arrives. 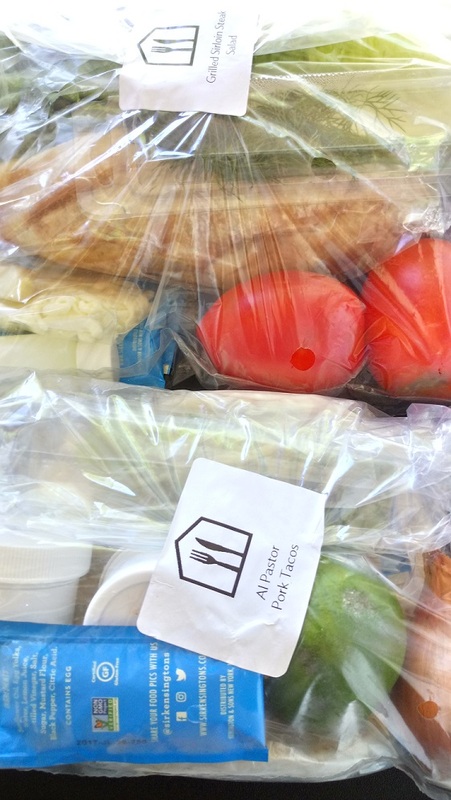 I will advise to make the meals within 1-2 days after receiving your box just to be safe though especially if you live in a warmer area during the Summer. 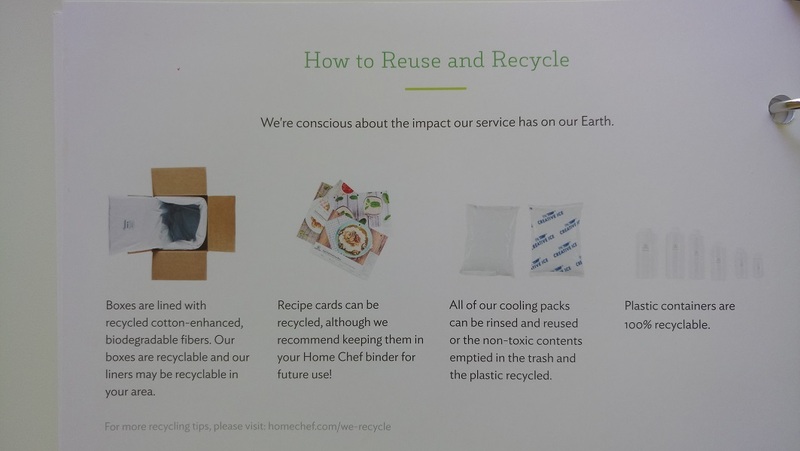 Here's something bonus that I thought was really cool about Home Chef, all their packaging and wrapping can be recycled! Boxes are lined with recycled cotton biodegradable fibers. Ice packs can be reused but are non toxic and the plastic can be recycled. So I was so busy making the meal and eating it that I spaced getting pictures of both (because for larger families these may not work so you have to make multiple ones to feed everyone) and of course everyone came running when dinner was ready and it was gone before I could blink. I can tell you that it was ALL GONE so that should tell you something BUT it also didn't look at picture perfect as expected but we all can't be Betty Crocker right? 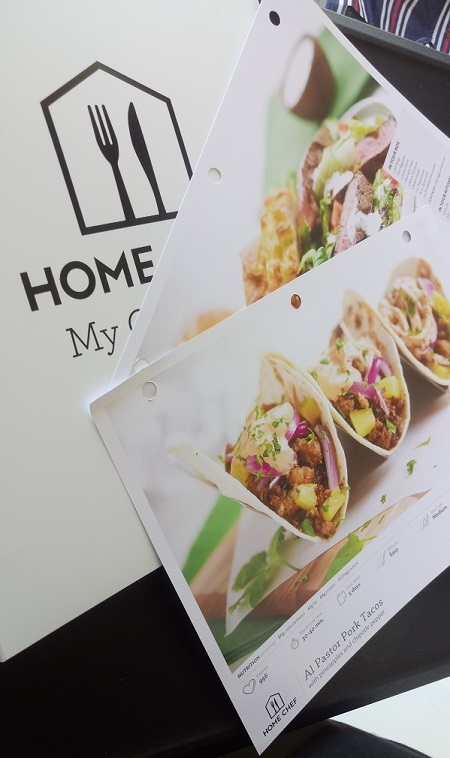 Would I recommend Home Chef? Totally! If you lead a busy life and hate trying to figure out what to make for dinner after a long day. If you have a larger family (like more than 4 people) I might advise getting more meals to spread it out more (you can also always add some more items from your own fridge).